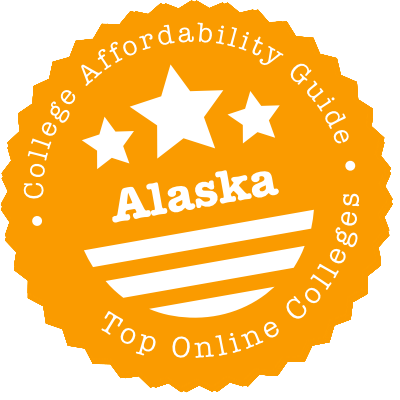 Scroll down to see the top not-for-profit colleges and universities in Alaska offering online degree programs. The three schools within the University of Alaska System combine to offer over 100 online degrees - about 75 percent of them require no visits to campus. University of Alaska Anchorage facilitates 19 of those programs, including a general associate degree. The remaining programs are highly specialized. The sole baccalaureate is a Nursing Science degree, and the half dozen master's programs range from Arctic Engineering to Special Education. Most prevalent are short certificate programs. There are occupational endorsement certificates in areas like Corrections and Medical Office Coding, as well as post-baccalaureate certificates in primarily nursing and education topics. The School of Education at UAF offers an online Master of Education (MEd) in Innovation and Design program. Students accepted to this program can choose from the following areas of specialization: cross-cultural education, curriculum and instruction, language and literacy, and online innovation and design. The university also offers a two-year Master of Arts (MA) in Administration of Justice degree that can be earned completely online. Newly offered online is a Master of Business Administration (MBA) program with the following fields of concentration: finance, human resource management, international business, management, marketing, and travel industry management. A professional graduate degree program (master's level) in security and disaster management is also available online. On the baccalaureate level, the university recently added a Bachelor in Business Administration (BBA) program to its online roster. There are two other online undergraduate programs currently offered - Bachelor of Emergency Management (BEM) and Bachelor of Arts (BA) in Justice. Online Associate of Applied Science (AAS) programs are available in accounting, business, and information technology. For students who wish to update their skills or explore a new field, UAF offers online graduate certificate programs in accounting technician, design and construction management, healthcare reimbursement, business management, and medical and dental reception. Befitting a school located in a large and sparsely populated state, the University of Alaska Southeast has a long list of programs that can be completed online. These range from occupational certificates to master's programs. The biggest number of programs are in the field of education. Undergrads can earn a bachelor's degree in elementary education or special education. At the graduate level, career changers can earn initial teacher certification with a Master of Arts in Teaching. Experienced educators can gain advanced training with a Master of Education in five specialties. Five graduate certificates are also offered for educators. UAS also grants associate degrees, including one in fisheries technology. Both technical and transfer associate degrees are available. Believe it or not, an online degree in Alaska comes with choice! Yes, the University of Alaska system dominates the landscape, but Alaska Pacific University is a viable alternative. Plus there’s always the option to explore distance education programs in other states—especially ones that provide discounts to Alaska learners. Whatever decision you make, you deserve to get a good education. That’s why we’ve put together this short guide to choosing an online program in Alaska. It contains tips on finding the right degree, profiles of affordable programs, advice on how to check for accreditation, and links to useful distance learning websites. University of Alaska schools—including all 3 UA campuses and community colleges like Sitka and Kenai Peninsula College—are deeply committed to online programs. UAA is working on a Robust Online Learning Initiative (ROLL) and UAF’s eLearning and Distance Education Division has developed an entire website (iTeachU) devoted to improving online teaching & coursework. What’s more, the vast majority of UAS degrees & certificates are earned through distance or hybrid programs. If you’re thinking of UA, the first place to go is Distance Learning at UA. This website has step-by-step enrollment advice, links to financial aid webpages, and a list of all University of Alaska online programs, regardless of campus. Many UA students are cross-enrolled in e-learning courses throughout the system. Visit the individual university/community college website for more detailed information. Alaska has an interesting approach to teacher certification. Along with the usual requirements—a bachelor’s degree from a regionally accredited college or university, fulfillment of a state-approved/NCATE-accredited teacher preparation program, passing scores on PRAXIS exams—all teachers are expected to complete two 3-credit hour courses: Multicultural (MC) and Alaska Studies (AK). These are frequently offered online! The Alaska Department of Education & Early Development (EED) has up-to-date lists of Approved MC and AK courses organized under each university. These must be completed at an Alaskan institution within the first two years of initial certification (i.e. during the teacher preparation program). We talk about student exchange programs through the Western Interstate Commission for Higher Education (WICHE) in our page on Affordable Colleges in Alaska, but they’re worth remembering when you’re thinking about distance learning. Programs like the Western Undergraduate Exchange (WUE) and Western Regional Graduate Program (WGRP) allow Alaska students to pay reduced tuition rates for out-of-state programs. Many of these programs will require you to be on-campus, but a few WUE institutions and WGRP institutions also offer online and hybrid degrees. To find out whether or not an institution offers the WUE or WGRP rate for your choice of online degree, WICHE recommends you call and ask. For this section, we only feature schools that appear on both our “Top Online” and “Most Affordable” lists. These universities must meet our criteria for quality, flexibility, price, and use of financial aid money. (You would see a CAG Score next to the profile in our ranking.) No schools in Alaska met those criteria in 2018, but the UA system is still worth investigating, especially if you receive financial aid. Alaska is fortunate in the sense that it’s small, so it’s hard for the bad guys to create degree mills and unaccredited universities (California has a much bigger problem!). Whenever you’re considering an online program, either in-state or out-of-state, always make sure that the school is fully accredited by an organization recognized by the U.S. Department of Education. Even though national accreditation applies to distance learning institutions, regional accreditation is preferable, especially if you’re thinking of transferring academic credits. The Northwest Commission on Colleges and Universities (NWCCU) is the organization that provides regional accreditation for the seven-state Northwest region of Alaska, Idaho, Montana, Nevada, Oregon, Utah, and Washington. It’s easy to check its updated list of regionally accredited Alaska institutions. NWCCU also posts Recent Commission Actions with info on schools that it has placed on warning or probation. It’s important to note that community colleges in the UA system are also regionally accredited. For example, Kenai Peninsula College (KPC), a college of the University of Alaska Anchorage, is fully accredited by NWCCU. If you’re unsure about a school outside of Alaska, the Council for Higher Education Accreditation (CHEA) Database lists both national & regional accreditations. Northwest Commission on Colleges and Universities (NWCCU): NWCCU provides regional accreditation for Alaska schools, including four-year universities and community colleges. Alaska Society for Technology in Education (ASTE): ASTE is responsible for promoting access to technology, connections to information resources, and technology integration for Alaskan learners. It develops “best practices” for teaching and holds an annual conference & leadership summit to discuss developments in the field. Western Interstate Commission for Higher Education (WICHE) Internet Course Exchange (ICE): WICHE ICE is intended to help students (through their home universities) access high quality online courses and programs offered by other four-year and two-year ICE member institutions. UAA participates in this initiative. Distance Learning at UA: On this website, you’ll find a list of all University of Alaska online programs on all 3 UA campuses (Anchorage, Fairbanks & Southeast). This list also includes programs offered by community colleges in the UA system.